Almost 350HP!! IPL, White on Red, Hartop, Where Luxury and Race Car Meet, Summer is Here! Must See! All we can say is WOW!!! The pictures really tell the whole story of this extremely rare white on red Infiniti G37 IPL! The IPL version of the Infiniti G37 is like the Nismo of Nissan. They are extremely hard to find, especially with a clean carfax with no blemishes and a ONE OWNER. Many of these cars have been ran through and are 3, 4, sometimes even 5 or 6 owner. Not to mention many have accidents or damage reported on top of many owners. To get one of these as a one owner who spent sticker price and took care of it as such is nearly impossible in itself. Then you throw in on the IPL the WHITE on RED color combination....Unicorn in the market! There is a good chance this is the ONLY pearl white on red IPL convertible in the state. Not for sale, but in general. This car is truly a rare gem. The curb appeal on this IPL is endless or one might say....Infiniti! ;) The Perfectly shaped body kit ONLY on the IPL version gives the illusion that this car is sitting on the ground like a race car. The front bumper has perfect curves and the big air vents that give it a mean look from the front. The IPL wheels are sick! The racing inspired 19 inch wheels are extremely light weight and wrapped with almost new Continental Conti- Procontact tires. That is great Value just in the tires. The IPL comes with upgraded brakes that are big and pop behind the the wheels. You need these big brakes from time to time with the power that this sports car produces. You will get up to high speeds quick without even realizing it. The IPL version has the sport suspension. With the upgraded suspension and low stance, this IPL handles sharp. A lot like a BMW. The IPL engine is naturally aspirated with no turbos. It has a whopping 343 Horsepower! Try and think of another 6 cylinder that has that much Horsepower without turbos. It's tough to do. The IPL version of the G37 actually has a tune on the engine give it 13 more horsepower than the G37 sport model. Driving this car for a few days after we bought it really had us fall in love. We were so caught up in the look that we forgot that the drive and power this car produces its really amazing. It takes turns like a BMW and has PLENTY of power to get up and GO!! This car is going to make someone unreal happy. It checks EVERY box! !...and it is hard for us to fall in love with cars now days because we have bought so many but every once in a while something like this White on red IPL comes in and we are in Awww...At the end of the day, we love cars! Lets move to the interior. The infiniti interiors arguably are the better than most every car on the market aesthetically. The seats in this IPL are big and bolstery, and when the top is down are beautiful pieces just to look at. The silver BOSE insert near the headrest is tasteful tough that is not seen very often. The IPL stitched into the back of the seat is signature and pops off the red. They are very comfortable for long road trips as well. Has all the high value options like Navigation/infotainment screen, back up camera, heated/ac seats ( very important for a comfortable), BOSE premium sound, bluetooth, all power options, and a power retractable top that goes down with the press of a button. We don't buy any soft top convertibles because if you get one small rip you have to replace the whole thing. Plus the hardtop convertibles are much better for year round. The weather in the Seattle area is getting nicer and nicer every year; and really is nice March through October. That's 8 months of top down driving. This car is a show stopper and will gets comments everywhere you go for as long as you own it. People don't see something like this everyday. This car creates soooo much value for someone that is not on paper. That is why people buy cars they love, because it brings them more value than they could ask for, that value is just immeasurable. 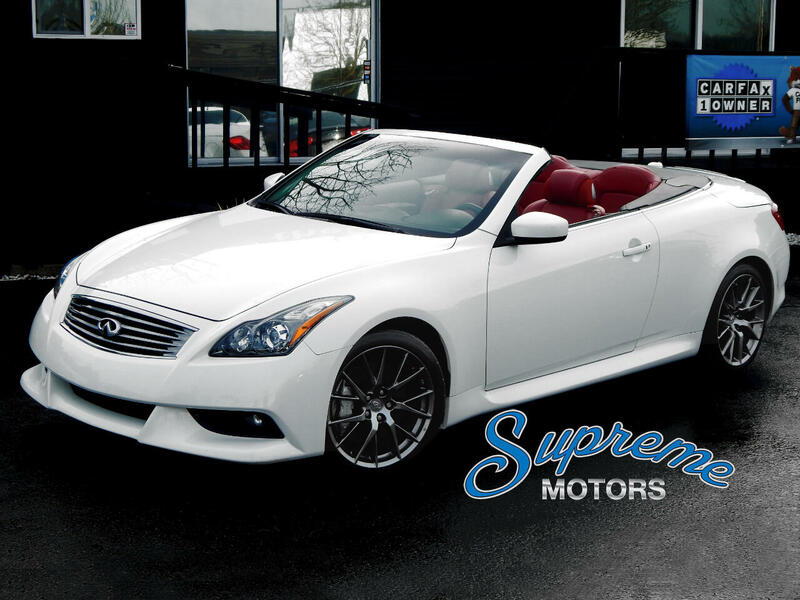 If you work hard and its time to reward yourself, then there is no better car than This White on Red IPL Infiniti convertible to treat yourself to. There will be zero regret for this buy, just endless joy! We also offer extended service contracts for the best deals in the state. They are extremely affordable on Japanese cars. We are ecstatic to have this car at our dealership and look forward to making someone's dream come true on this one! MUST SEE!!!! Remember one of the most important factors on any purchase is that it is not an east coast car, Florida, Texas, Canadian, Michigan, Illinois. We dont sell ANY rust buckets AKA most non west coast cars, or cars that the undersides have been painted or had under coating applied to hide corrosion. This assures no rust or corrosion or the chances it was involved in a flood or hurricane. We had to pay over $4000 more for this IPL because it had a clean history, its white on red, all the options, and the sport package! We could have bought a 2013 IPL in silver with the tan interior, or an accident on the Carfax, from New York (or any rust area), without a package or two, with the exact same miles and WE could have it priced at $23900, but that does not mean it is a better "DEAL". Its just a lower price for a lot less quality. Its a lower price, NOT THE BEST OVERALL DEAL. Its an investment and what you are going to own and drive around for 1-15 years. Buy the right one @ Supreme Motors. We carry ONLY the FINEST! Black on black with EVERY MUST HAVE OPTION, and a clean Carfax from the west coast! THATS VALUE and will ALWAYS be worth more than the questionable rust bucket, car with an accident, or a bland color combination! Message: Thought you might be interested in this 2013 Infiniti G Convertible.